Sends events when a GUI Texture or GUI Text is touched. Optionally filter by a fingerID. The Game Object that owns the GUI Texture or GUI Text. Only detect touches that match this fingerID, or set to None. Event to send on touch began. Event to send on touch moved. Event to send on stationary touch. Event to send on touch ended. 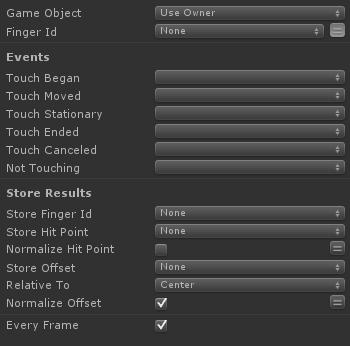 Event to send on touch cancel. Store the fingerId of the touch. Store the screen position where the GUI element was touched. Normalize the hit point screen coordinates (0-1). Store the offset position of the hit. How to measure the offset. Last modified on 9/17/2011 4:53 PM by User.